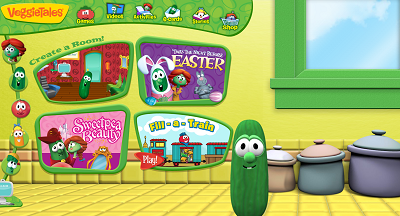 In 2011, BigIdea released a new version of their website, BigIdea.com, under the name VeggieTales.com. This new website included brand new games, including Veggie Football, Fill-a-Train, and Rescue Sweetpea among others. However, the website was revamped sometime in early 2014, thus removing all games from the website. The games can no longer be played, and they’re not accessible through the Internet Archives. Despite this, the gameplay of some of the games were made before the site was revamped. On September 15, 2018, LMW forums user Bagman found versions of Fill-A-Train and Tilt-A-Pea that worked in Firefox on the Internet Archive. LMW user TropesAreDangerous made this version of Tilt-A-Pea playable offline through the standalone version of Adobe Flash Player as well. The same user also found partially working versions of Veggie Football and Rescue Sweetpea. However, the audio files will not play unless the config.xml files can be repaired. Offline version of Veggie Football (no sound). Offline version of Rescue Sweetpea (no sound).